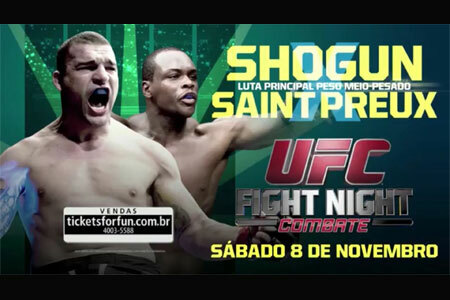 “UFC Fight Night: Shogun vs. Saint Preux” goes down Saturday night inside Ginasio Municipal Tancredo Neves in Uberlandia, Minas Gerais, Brazil. Fox Sports 1 will broadcast the entire event live starting at 8PM ET/5PM PT. The main card begins at 10:30PM ET/7:30PM PT. Former UFC light heavyweight champion Mauricio “Shogun” Rua meets Ovince Saint Preux in tonight’s featured tango. Warlley Alves and Alan Jouban collide in the co-main event.